Who says mason jars have to store wet food? 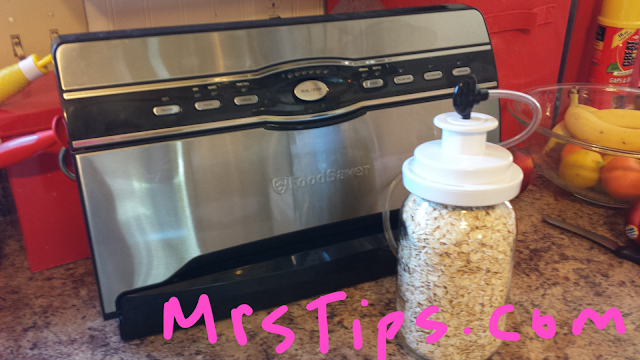 Thanks to Wendy DeWitt, I now know how even MORE valuable our Food Saver is. We wore out the FoodSaver I asked my parents to give us for Christmas 7-8 years ago, so for Tips' birthday this past May we asked his mom for a new one. It takes up even less counter space than its predecessor! Here is the back story to my mini food storage project today: last year we got weevils in a LOT of our food. They originally came from some apricots we had dried. Anyway, they also got into the 25 lb bag of oatmeal we had at the time and the oatmeal also went somewhat rancid because it had been open too long. Then last fall when I was in the throes of hyperesmesis gravidarium (really bad morning sickness), mice got into our house and I was really paranoid they would eat through the bag. So we bought some more 5-gallon food grade bags to store our bulk food in. We thought we got rid of the mice (killed them all), but they showed up again two weeks ago. We finally got pest control last week. I am also realizing just how little room I have in my current home for big bags or buckets of food. Last night as I was pondering this dilemma, it occurred to me that I have a TON of unutilized glass quart jars. So today I ran them through the dishwasher along with the lids to sanitize them all, and when they were dry I proceeded to fill the bottles with the 15 pounds of oatmeal that was still in the bag and vacuum seal the bottles with the regular mouth jar FoodSaver attachment. 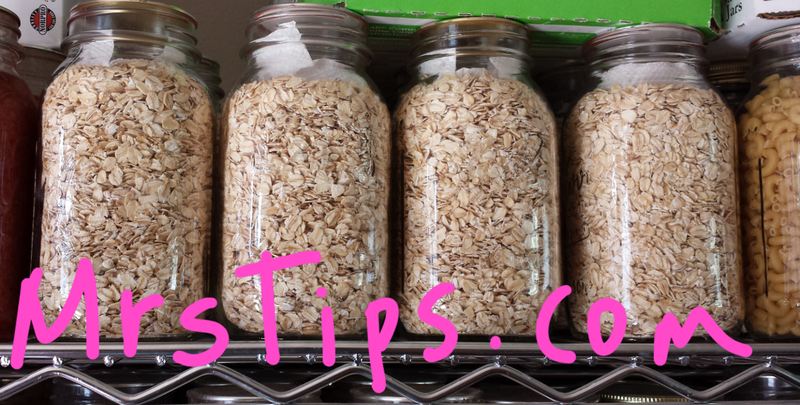 I was able to put about 3-1/2 cups of oatmeal in each quart mason jar and filled 20 bottles. I calculated that since we eat 1-1/2 cups of oatmeal a day, we will go through 5 bottles every two weeks (eating oatmeal for breakfast 5 days a week). That means our 20 bottles (15 pounds) will last us 2 months. That is only one month shy of having a 3 month supply of breakfast food for our Monday-Friday breakfasts! My kids actually like oatmeal AND since I soak it for 24 hours in any of the following: water + whey, water + kefir, OR water + lemon juice to break down the anti-nutrients in it, it is SO much healtheir (and cheaper) than cold cereal. Anyway...just wanted to shatter my little project with you all. And now that I have the Samsung S4 for my phone, I am able to blog from my phone like I have always wanted to! (My first android phone didn't quite have the capabilities I wanted it to have). Yay!! !